Calorease is suitable for omnivores and vegans. For my Sister-in-law's upcoming wedding, I wanted to lose five pounds. That didn't seem an impossibility in 5 weeks but it was going to take a serious commitment. With school starting back, we have gotten back into our normal routine which has aided immensely in Operation: Lose 5lbs. in 5 weeks. We are walking to school. Exercise - check. I am menu planning faithfully. Eating well - check. Taking vitamins throughout the day instead of one lump. TONS of water - check. Using Calorease as a dietary supplement? Check. Wait a minute, that isn't part of my normal routine. Calorease is a naturally sourced fiber supplement that I was sent from Mom's Meet to review. Regular fiber helps eliminate fat from the body with a ratio of 1:1, whereas the plant based fiber used in Calorease is unique in that it eliminates up to 9 times its weight in dietary fat! I have felt no side effects from this product. Whew! Although even if I did, the list of side effects is pretty nominal. 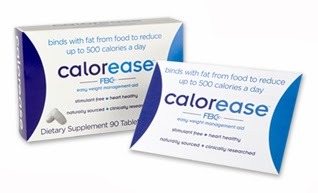 My one issue with Calorease is that to get the fullest benefit, you need to take the tablets with meals that have a significant fat content on a regular basis since the fiber formula binds with fat. Which is great, but I don't tend to eat high fat meals most of the time. But, if I know that I will be going out to eat or eating something that has a higher fat content, then I take it with those meals. And for those times, it's great because I don't feel quite so guilty eating pizza. Pizza is my downfall. I blame it on the cheese...and the dough...but mostly the cheese. Calorease isn't a quick fix. It doesn't make you feel fuller faster. It's not a stimulant or a diuretic. It doesn't help you make better choices. It's not a miracle. What it is, is that little extra boost to help you achieve your weight loss goals. It's a gentle push across the finish line. You make the decision to get rid of the old fat by making healthy choices and it helps you not take on new fat - truly, a weight loss aid. I don't know if it is the regular exercise, the massive intake of water, or the Calorease, but something is working; I'm down four pounds with one week to go. Fingers crossed! And to keep up with the latest info and promotions from Calorease, please "like" their Facebook page. *I was sent a box of Calorease to sample and review from Mom's Meet. All opinions and lack of fitness are my own and may not necessarily reflect those of the May Media Group or the manufacturer.